Not to be confused with Melee (game). Super Smash Bros. Melee[a] is a crossover fighting video game developed by HAL Laboratory and published by Nintendo for the GameCube. It was first released in Japan on November 21, 2001, in North America on December 3, 2001, in Europe on May 24, 2002, and in Australia on May 31, 2002. The second installment in the Super Smash Bros. series, it features characters from Nintendo video game franchises such as Mario, The Legend of Zelda, Star Fox, and Pokémon. The stages and gameplay modes reference or take designs from these franchises as well. Melee includes all playable characters from the first game, and also adds characters from franchises such as Fire Emblem, of which no games had been released outside Japan at the time. Melee's gameplay system offers an unorthodox approach to the fighting game genre, with a counter that measures damage with increasing percentages, representing the knockback the character will experience, rather than a depleting health bar seen in most fighting games. It builds on the first game by adding new gameplay features and playable characters. Following the popularity of its multiplayer gameplay, Melee has been featured in many competitive gaming tournaments, and is one of the most popular competitive fighting games. 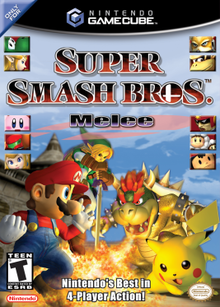 Super Smash Bros. Melee received critical acclaim, as well as several awards and acknowledgements from various publications; it is now considered one of the greatest video games ever made. It achieved strong sales upon its release, becoming the GameCube's best-selling title with over seven million copies sold by 2008. Super Smash Bros. Melee was followed by Super Smash Bros. Brawl for the Wii in 2008. Like its predecessor, Super Smash Bros. Melee differs from traditional fighting games as the objective is to force their opponents beyond the boundaries of the stage. Most attacks inflict damage and can, if enough damage is dealt, knock back the enemy. Each character's health is measured by a meter that represents damage as a percentage. The higher the percentage value, the farther the player gets knocked back, and the easier they are to knock off the stage, which will result in the character's death and the loss of a stock, or life. Unlike other games of the same genre, in which moves are entered by button-input combinations, most moves in Super Smash Bros. Melee can be accessed via one-button presses and a joystick direction. During battles, items related to Nintendo games or merchandise fall onto the game field. These items have purposes ranging from inflicting damage on the opponent to restoring health to the player. Additionally, most stages have a theme relating to a Nintendo franchise or a specific Nintendo game and are interactive to the player. Although the stages are rendered in three dimensions, players can only move on a two-dimensional plane. Not all stages are available immediately; some stages must be "unlocked" by achieving particular requirements. Some stages feature moving elements and platforms and hazards that harm players, while others lack these elements. Single-player mode provides the player with a variety of side-scrolling fighting challenges. The applicable modes range from "Classic Mode", which involves the player battling multiple opponents and a boss character, to the "Home Run Contest", a minigame involving the player trying to launch a sandbag as far as possible with a Home Run Bat. Some of these modes are personalized for the character; for example, the "Target Test" sets out a specialized area for a character in which they aim to destroy ten targets in the least amount of time they can. These areas may include references to that particular character's past and legacy. The "Board the Platforms" minigame from the prequel was not included in Melee. Melee introduced "Adventure Mode", which takes the player to several predefined universes of characters in the Nintendo franchise. "All-Star Mode" is an unlockable feature that requires the player to defeat every character in the game while having only three health supplements between battles. Bowser, Ness from EarthBound, Kirby, and Yoshi fight in a "Sudden Death" match on the Corneria stage, based on Star Fox. In the multiplayer mode, up to four players or computer-controlled characters may fight in a free-for-all or on separate teams. The central processing unit (CPU) characters' artificial intelligence (AI) difficulty is ranked from one to nine in ascending order of difficulty. Individual players can also be handicapped; the higher the handicap, the stronger the player. Victory is determined in five ways, depending on the game type. The most common multiplayer modes are “Time mode”, where the player or team with the most KOs and least falls wins after a predetermined amount of time, and "Stock mode", a battle in which the last player or team with lives remaining wins. This can be changed to less conventional modes like "Coin mode", which rewards the richest player as the victor. Players must collect coins created by hitting enemies and try not to lose them by falling off the stage; harder hits release higher quantities of coins. Other options are available, updating from Super Smash Bros., such as determining the number and type of items that appear during the battle. Trophies (known as "Figures" in the Japanese version) of various Nintendo characters and objects can be collected throughout the game. These trophies include figures of playable characters, accessories, and items associated with them as well as series and characters not otherwise playable in the game. The trophies range from the well-known to the obscure, and even characters or elements only released in Japan. Super Smash Bros. had a similar system of plush dolls; however, it only included the 12 playable characters. One trophy is exclusive to the Japanese version of the game. Super Smash Bros. Melee features 25 (26 if Zelda and Sheik are considered separate) characters, 13 more than its predecessor. Fourteen are available initially, while the other 11 characters require completing specific tasks to become available. Every character featured in the game is derived from a popular Nintendo franchise. All characters have a symbol that appears behind their damage meter which represents their series, such as a Triforce symbol behind Link's damage meter and a Poké Ball behind a Pokémon species. Some characters represent popular franchises, while others were less-known at the time of the release; Marth and Roy represent the Fire Emblem series, which was not released outside Japan at the time. The characters' appearance in Super Smash Bros. Melee led to a rise in the popularity of the series. References are made throughout the game to the relationship between characters of the same universe; in one of the events from "Event mode", Mario must defeat his enemy Bowser to rescue Princess Peach. Furthermore, each character has recognizable moves from their original series, such as Samus's firearms from the Metroid series and Link's arsenal of weapons. HAL Laboratory developed Super Smash Bros. Melee, with Masahiro Sakurai as the head of production. The game was one of the first games released on the GameCube and highlighted the advancement in graphics from the Nintendo 64. The developers wanted to pay homage to the debut of the GameCube by making an opening FMV sequence that would attract people's attention to the graphics. HAL worked with three separate graphic houses in Tokyo to make the opening sequence. On their official website, the developers posted screen shots and information highlighting and explaining the attention to physics and detail in the game, with references to changes from its predecessor. The game was in development for 13 months, and Sakurai called his lifestyle during this period "destructive" with no holidays and short weekends. Unlike the experimental first Super Smash Bros., he felt great pressure to deliver a quality sequel, claiming it was the "biggest project I had ever led up to that point". Despite the painful development cycle, Sakurai proudly called it "the sharpest game in the series... it just felt really good to play", even compared to its successor, Super Smash Bros. Brawl. On the game's official Japanese website, the developers explain reasons for making particular characters playable and explain why some characters were not available as playable characters upon release. Initially, the development team wanted to replace Ness with Lucas, the main character of Mother 3, but retained Ness in consideration of delays. The game's creators later included Lucas in the game's sequel, Super Smash Bros. Brawl. Video game developer Hideo Kojima originally requested the inclusion of Solid Snake to Sakurai, but the game was too far into development. As with Lucas, development time allowed for his inclusion in Brawl. Marth and Roy were initially intended to be playable exclusively in the Japanese version of Super Smash Bros. Melee. However, they received favorable attention during the game's North American localization, leading to the decision for the developers to include them in the Western version. Sakurai stated that the development team had suggested characters from four other games to represent the Famicom/NES era until the developers decided that the Ice Climbers would be in the game. The developers have noted characters that have very similar moves to each other on the website; such characters have been referred to as "clones" in the media. Nintendo also considered including GoldenEye 007's version of James Bond in the game, but this did not come to fruition. According to Sakurai, there were a number of problems preventing Bond's inclusion; these included his uses of realistic weapons and actor Pierce Brosnan's likeness, and the fact that Nintendo did not have the rights to the character. Nintendo presented the game at the Electronic Entertainment Expo 2001 as a playable demonstration. The next major exposition of the game came in August 2001 at Spaceworld, when Nintendo displayed a playable demo that updated from the previous demo displayed at E3. Nintendo offered a playable tournament of the games for fans in which a GameCube and Super Smash Bros. Melee were prizes for the winner. Before the game's release, the Japanese official website included weekly updates, including screenshots and character profiles. Nintendo followed this trend with Super Smash Bros. Brawl, in which there were daily updates by the game's developer, Masahiro Sakurai. Japanese gaming magazine Famitsu reported that Nintendo advertised the game in between showings of Pokémon 4Ever across movie theaters in Japan. In January 2003, Super Smash Bros Melee became part of the Player's Choice, a marketing label used by Nintendo to promote video games that have sold more than a million copies. In August 2005, Nintendo bundled the game with the GameCube for $99.99. Super Smash Bros. Melee features both new and re-arranged music from many of Nintendo's popular gaming franchises. In 2002, Enterbrain released a soundtrack in Japan titled Dairantou Smash Brothers DX Orchestra Concert. The same soundtrack was released in 2003 as Smashing... Live! as a bonus for subscribing to Nintendo Power magazine in North America, and also as a free gift in an issue of the British Official Nintendo Magazine. The soundtrack does not include music taken directly from the game, but features many live orchestral arrangements performed by the New Japan Philharmonic. The game contains a number of unlockable tracks that can be obtained after making certain in-game accomplishments. On the same website, the developers have posted discussions about the game's music and voice acting between Masahiro Sakurai and the game's composers. Dean Harrington is the game's in-game narrator, and also voices Master Hand and Crazy Hand. Super Smash Bros. Melee received critical acclaim from reviewers, most of whom credited Melee's expansion of gameplay features from Super Smash Bros. Focusing on the additional features, GameSpy commented that "Melee really scores big in the 'we've added tons of great extra stuff' department". Reviewers compared the game favorably to Super Smash Bros. IGN's Fran Mirabella III stated that it was "in an entirely different league than the N64 version"; GameSpot's Miguel Lopez praised the game for offering a more advanced "classic-mode" compared to its predecessor, while detailing the Adventure Mode as "really a hit-or-miss experience". Despite a mixed response to the single-player modes, many reviewers expressed the game's multiplayer mode as a strong component of the game. In their review of the game, GameSpy stated that "you'll have a pretty hard time finding a more enjoyable multiplayer experience on any other console". Melee's visuals garnered a positive reaction. GameSpot lauded the game's character and background models, stating that "the character models are pleasantly full-bodied, and the quality of their textures is amazing". IGN's Fran Mirabella III praised the game's use of physics, animation and graphics, although his colleague Matt Casamassina thought that "some of the backgrounds lack the visual polish endowed upon the characters" when giving a second opinion about the game. Critics praised the game's orchestrated soundtrack; while GameSpot's Greg Kasavin commented that "it all sounds brilliant". GameSpy praised the music for its nostalgic effect, with soundtracks ranging from multiple Nintendo series. Reviewers have welcomed the simplistic controls, but its "hyper-responsiveness", with the characters easily dashing and precise movements being difficult to perform, was expressed as a serious flaw of the game by GameSpot. With a milder criticism of controls, Bryn Williams of GameSpy commented that "movement and navigation seems slightly too sensitive". The basis of Melee's gameplay system is the battles between Nintendo characters, which has been suggested as being overly hectic; N-Europe questioned whether the gameplay is "too Frantic? ", even though they enjoyed the variety of modes on offer. Similarly, Nintendo Spin's Clark Nielsen stated that "Melee was too fast for its own good", and "skill was more about just being able to wrap your head around what was happening as opposed to really getting into the combat". In regards to the pace of the game, Edge commented that it even made gameplay features such as "blocking" redundant, as the player is not given enough time to react to an attack. Despite the new features added to the game, some reviews criticized Melee for a lack of originality and for being too similar to its predecessor, Super Smash Bros. Caleb Hale from GameCritics.com noted that while it was "every bit as good as its Nintendo 64 predecessor" he also felt "the game doesn't expand much past that point". On a similar note, Edge stated that "it's not evolution; it's reproduction", in reference to a perceived lack of innovation. The nostalgic nature of the game received a positive reaction, as well as the accompanying stages and items that allude to past Nintendo games. Gaming journalists have welcomed the roster of 25 Nintendo characters, as well as the trophy system, which Nintendo Spin labeled as "a great addition to this game". When released in Japan, it became the fastest selling GameCube game with 358,525 units sold in the week ending November 25, 2001. This success continued as the game sold more than a million units only two months after its release, making it the first GameCube title to reach a million copies. The game also sold well in North America, where it sold 250,000-copies in nine days. In the United States, Super Smash Bros. Melee was the 19th best-selling video game in 2001 according to the NPD Group. By July 2006, it had sold 3.2 million copies and earned $125 million in the United States alone. Next Generation ranked it as the fifth highest-selling game launched for the PlayStation 2, Xbox or GameCube between January 2000 and July 2006 in that country. Approximately 4.06 million units have been sold in the country as of December 27, 2007. With a software-to-hardware ratio of 3:4 at one time, some have attributed the increasing sales of the GameCube near the launch date to Melee. As of March 10, 2008, Super Smash Bros. Melee is the best-selling GameCube game, with more than seven million copies sold worldwide. It has been estimated that at one point in time 70% of all GameCube owners also owned Melee. Several publications have acknowledged Super Smash Bros. Melee in competitions and awards. In their "Best of 2001" awards, GameSpy chose it as Best Fighting GameCube Game, IGN's reader choice chose it as Game of the Year, Electronic Gaming Monthly chose it as Best Multiplayer and Best GameCube Game, and GameSpot chose it as the Best GameCube Game and tenth best game of the year. GameFAQs placed it sixth in a poll of the 100 best games ever and was in the final four of the "Best. Game. Ever." contest. In the 200th issue of Electronic Gaming Monthly, the editors selected Melee as the 92nd most influential game in their "Top 200 Games of Their Time" list, defining Melee as "Billions of things to unlock, plus Yoshi pummeling Pikachu with a bat". In a similar competition, Nintendo Power named Super Smash Bros. Melee the 16th best game ever to appear on a Nintendo console, and selected it as the 2001 "Game of the Year". IGN named it the third best GameCube game of all-time in 2007 as a part of a feature reflecting on the GameCube's long lifespan, citing it as "the grand stage of fighters, much like Mario Kart is for racing fans". GameSpy chose it as fourth in a similar list, citing that it had "better graphics, better music, more characters, more gameplay modes, more secrets to discover" in comparison to its predecessor. The game was ranked 58th in Official Nintendo Magazine's "100 Greatest Nintendo Games Ever" feature. In 2019, Game Informer ranked it as the 2nd best fighting game of all time. Super Smash Bros. Melee is a widely played competitive video game and has been featured in several high-profile tournaments. Many consider it to be the most competitively viable game in the series. From 2004 to 2007, Major League Gaming sponsored Melee on its Pro Circuit. Although dropping Melee from its 2007 Pro Circuit, MLG still sponsored a number of tournaments as part of the Underground Smash Series. Melee was also included in the Evolution Championship Series (Evo) in 2007, a fighting game tournament held in Las Vegas and was hosted at Evo 2013 after a charity vote to decide the final game to be featured in its tournament lineup. Due to the large turnout and popularity that year, Evo again included Melee at their 2014, 2015, 2016, 2017 and 2018 events. In 2014 Melee was played at MLG Anaheim. Evo 2016 is the largest Melee tournament to date with 2,350 entrants. Ken Hoang, also known as "The King of Smash", considered to be the game's best player from 2003 to 2006, has won over $50,000 from Smash tournaments. As of August 2018, Adam "Armada" Lindgren has won over $300,000 from Smash tournaments in total and over $90,000 in 2017 alone, placing his tournament winnings as one of the highest of all professional Melee players. Several professional Melee players including Christopher "KillaOR" McKenzie, Isai Alvarado, and Ken were seen in the 2005 "I'm a Professional Gamer" episode of the MTV reality series True Life. The competitive Smash community was featured in a 2013 crowd-funded documentary called The Smash Brothers. The film detailed the history of the professional scene and profiled seven prominent Melee players including Hoang, Azen, Jason "Mew2King" Zimmerman, Isai, PC Chris, KoreanDJ, and Evo 2013 and Evo 2014 champion, Joseph "Mang0" Marquez. Commentary footage from a Melee tournament is the origin of the Wombo combo internet meme. At the pre-E3 conference of 2005, Nintendo announced Melee's sequel, 2008's Super Smash Bros. Brawl. Nintendo's president, Satoru Iwata requested Masahiro Sakurai to be the director of the game after the conference. Although being slower paced than Melee, the game retains most of the gameplay features of its predecessors while having major gameplay additions, such as a more substantial single-player mode and online play via the Nintendo Wi-Fi Connection Taking advantage of the Wii's variety of controller options, the game allows the use of the Wii Remote, Nunchuk, GameCube controller, and the Classic Controller. Like Melee, the game makes references to games and franchises, including those that debuted after the release of Melee; for example, Link, Zelda, and Ganondorf's character designs are taken from The Legend of Zelda: Twilight Princess and a Nintendogs puppy is present as an Assist Trophy (a new item that summons computer-controlled characters from different games to briefly participate in the fight). Select stages and music from Melee are included in the sequel. The fourth and fifth installments, Super Smash Bros. for Nintendo 3DS and Wii U, were released in 2014 for the Nintendo 3DS and Wii U respectively. The sixth installment, Super Smash Bros. Ultimate released in December 2018, for the Nintendo Switch. ^ Mirabella III, Fran; Peer Schenider; Craig Harris. "Guides: Super Smash Bros. Melee". IGN. Retrieved December 22, 2007. ^ "Super Smash Bros. Melee—Game Freaks 365". Game Freaks 365. December 3, 2001. Archived from the original on May 6, 2008. Retrieved December 22, 2007. ^ Mirabella III, Fran; Peer Schenider; Craig Harris. "Guides: Super Smash Bros. Melee—Introduction". IGN. Retrieved December 29, 2007. ^ Mirabella III, Fran; Peer Schenider; Craig Harris. "Guides: Super Smash Bros. Melee—Basics". IGN. Retrieved December 22, 2007. ^ a b Mirabella III, Fran; Peer Schenider; Craig Harris. "Guides: Super Smash Bros. Melee—Items". IGN. Retrieved December 22, 2007. ^ a b Mirabella III, Fran; Peer Schenider; Craig Harris. "Guides: Super Smash Bros. Melee—Stages". IGN. Retrieved December 22, 2007. ^ Mirabella III, Fran; Peer Schenider; Craig Harris. "Guides: Super Smash Bros. Melee—Classic Mode". IGN. Archived from the original on December 9, 2006. Retrieved December 22, 2007. ^ Mirabella III, Fran; Peer Schenider; Craig Harris. "Guides: Super Smash Bros. Melee—Home Run Contest". IGN. Retrieved December 22, 2007. ^ Mirabella III, Fran; Peer Schenider; Craig Harris. "Guides: Super Smash Bros. Melee—Target Test". IGN. Retrieved December 22, 2007. ^ Super Smash Bros. Melee instruction booklet (PDF). p. 32. ^ "Guides: Super Smash Bros. Melee previews—Yahooo". Yahoo. November 27, 2001. Archived from the original on July 5, 2008. Retrieved December 22, 2007. ^ a b c d e f Mirabella III, Fran (December 3, 2001). "IGN: Super Smash Bros Melee review". IGN. Retrieved December 14, 2007. ^ Mirabella III, Fran; Peer Schenider; Craig Harris. "Guides: Super Smash Bros. Melee—Trophies". IGN. Retrieved December 22, 2007. ^ Mirabella III, Fran; Peer Schenider; Craig Harris. "Guides: Super Smash Bros. Melee—Secrets". IGN. Retrieved December 22, 2007. ^ "Character roster" (in Japanese). Nintendo. Retrieved February 6, 2008. ^ Mirabella III, Fran; Peer Schenider; Craig Harris. "Guides: Super Smash Bros. Melee–Characters". IGN. Retrieved December 22, 2007. ^ Mirabella III, Fran; Peer Schenider; Craig Harris. "Guides: Super Smash Bros. Melee—Marth". IGN. Retrieved December 22, 2007. ^ "'Fire Emblem (GBA)'". NinDB. Archived from the original on June 25, 2010. Retrieved December 22, 2007. ^ Mirabella III, Fran; Peer Schenider; Craig Harris. "Guides: Super Smash Bros. Melee—Events". IGN. Retrieved December 22, 2007. ^ Mirabella III, Fran; Peer Schenider; Craig Harris. "Guides: Super Smash Bros. Melee–Samus Aran". IGN. Retrieved December 22, 2007. ^ "Smash Bros. FMV Explained". IGN. August 31, 2001. Retrieved November 24, 2007. ^ "A Detailed Melee". IGN. September 7, 2001. Retrieved November 24, 2007. ^ a b George, Richard (December 8, 2010). "Super Smash Bros Creator: "Melee The Sharpest"". IGN. ^ Sakurai, Masahiro (July 17, 2001). "Super Smash Bros. Melee" (in Japanese). Nintendo. Retrieved November 24, 2007. ^ Sakurai, Masahiro (October 1, 2007). "Super Smash Bros. Brawl—Lucas". Nintendo. Archived from the original on November 24, 2007. Retrieved November 24, 2007. ^ Sakurai, Masahiro (September 21, 2007). "Super Smash Bros. Brawl—Snake". Nintendo. Archived from the original on June 23, 2012. Retrieved November 24, 2007. ^ "E306 Super Smash Bros. Brawl Q&A". Kotaku. May 11, 2007. Archived from the original on June 4, 2006. Retrieved December 30, 2007. ^ Sakurai, Masahiro (January 15, 2002). "Super Smash Bros. Melee—Roy" (in Japanese). Nintendo. Retrieved November 24, 2007. ^ Sakurai, Masahiro (December 14, 2001). "Super Smash Bros. Melee—Marth" (in Japanese). Nintendo. Retrieved November 24, 2007. ^ "Roy" (in Japanese). Nintendo. January 15, 2002. Retrieved January 11, 2008. ^ "IGN: Super Smash Bros. Melee". IGN. January 10, 2002. Archived from the original on May 9, 2008. Retrieved January 11, 2008. ^ Riley Little (January 14, 2019). "GoldenEye's James Bond In Super Smash Bros. Melee? Why It Didn't Happen". Screen Rant. Archived from the original on January 15, 2019. Retrieved January 15, 2019. ^ "IGN: E3: Hands-on Impressions for Super Smash bros Melee". IGN. May 17, 2001. Retrieved November 24, 2007. ^ "IGN: Spaceworld 2001: Super Smash Bros Melee hands-on". IGN. August 25, 2001. Retrieved November 24, 2007. ^ "Super Smashing Moves". IGN. July 19, 2001. Retrieved November 24, 2007. ^ "Super Smash Bros. Melee" (in Japanese). Nintendo. Retrieved November 24, 2007. ^ "Super Smash Bros. Brawl". Nintendo. Archived from the original on November 13, 2007. Retrieved November 24, 2007. ^ "Nintendo kicks-off GameCube hype in Japan". IGN. July 12, 2001. Retrieved November 24, 2007. ^ "Nintendo Expands Player's Choice Line-up". IGN. January 23, 2003. Retrieved November 24, 2007. ^ Casamassina, Matt (July 7, 2005). "Super Smash Bros. Bundle". IGN. Retrieved November 24, 2007. ^ Wachman, Dylan (August 21, 2005). "Smashing…Live! Review". Sputnik Music. Retrieved March 15, 2008. ^ "Attending hidden manipulation" (in Japanese). Nintendo. January 25, 2002. Retrieved January 10, 2008. ^ "Super Smash Bros. Melee for GameCube Reviews". Metacritic. CBS Interactive. Retrieved July 14, 2013. ^ Frankle, Gavin. "Super Smash Bros. Melee Review". AllGame. Archived from the original on November 14, 2014. Retrieved August 6, 2017. ^ a b c "Super Smash Bros. DX review". Edge (106): 89. January 2002. ^ a b c d e Bramwell, Tom (May 23, 2002). "Super Smash Bros Melee//GC//Eurogamer". Eurogamer. Retrieved December 14, 2007. ^ ニンテンドーゲームキューブ - 大乱闘スマッシュブラザーズDX. Weekly Famitsu. No.915 Pt.2. Pg.96. June 30, 2006. ^ "Geimen.net (Japanese)" (in Japanese). Geimen.net. Archived from the original on April 22, 2006. Retrieved December 14, 2007. ^ a b c d e f g Lopez, Miguel (December 1, 2001). "Super Smash Bros Melee for GameCube review—GameSpot". GameSpot. Retrieved December 14, 2007. ^ "Rated GameCube". Official Nintendo Magazine (1). March 2006. ^ a b c d e f g h Williams, Bryn (December 3, 2001). "Super GameSpy: Smash Bros Melee review". GameSpy. Retrieved December 14, 2007. ^ a b "N-Europe: Smash Bros :Melee review". N-Europe. April 11, 2001. Archived from the original on December 25, 2008. Retrieved December 15, 2007. ^ Nielsen, Clark (May 27, 2007). "The Games We Hate". Nintendo Spin. Archived from the original on December 11, 2008. Retrieved February 24, 2008. ^ Hale, Caleb (February 20, 2002). "GameCritics.com: Smash Bros :Melee review". GameCritics.com. Archived from the original on December 31, 2007. Retrieved December 15, 2007. ^ Zuk, Michal (April 25, 2004). "Super Smash Bros Melee—Nintendo Spin". Nintendo Spin. Archived from the original on July 4, 2007. Retrieved December 23, 2007. ^ a b "Smash Bros. Melee hot in Japan". IGN. November 29, 2001. Retrieved December 21, 2007. ^ a b "Smash Bros. Melee "Million" in Japan". IGN. January 16, 2002. Retrieved December 21, 2007. ^ Satterfield, Shane (December 14, 2001). "Nintendo announces more sales figures". GameSpot. Retrieved December 21, 2007. ^ "Annual 2001 Video Game Best-Selling Titles". NPDFunworld. NPD Group. Archived from the original on June 27, 2002. Retrieved March 12, 2008. ^ "Annual 2001 Video Game Best-Selling Titles". NPDFunworld. NPD Group. Archived from the original on April 24, 2003. Retrieved March 12, 2008. ^ "US Platinum chart games". The Magic Box. December 27, 2007. Archived from the original on April 21, 2007. Retrieved February 21, 2008. ^ "At Long Last, Nintendo Proclaims: Let the Brawls Begin on Wii!". Nintendo. March 10, 2008. Archived from the original on October 14, 2013. Retrieved March 15, 2008. ^ a b Why 'Super Smash Bros. Melee' Is Still the King. Wenner Media. December 5, 2016. Archived from the original on April 30, 2017. Retrieved December 5, 2016. ^ "GameCube Fighting Game of the Year: Super Smash Bros. Melee". GameSpy. Archived from the original on December 20, 2007. Retrieved December 23, 2007. ^ "Insider: Reader's Choice awards". IGN. January 19, 2001. Archived from the original on August 13, 2004. Retrieved December 23, 2007. ^ "2001 "Gamers' Choice Awards"". Electronic Gaming Monthly. Ziff Davis (153). April 2002. ISSN 1058-918X. Archived from the original on March 6, 2008. ^ "The Best and Worst of 2001: Best GameCube Game". GameSpot. Archived from the original on October 9, 2002. Retrieved December 23, 2007. ^ "The Best and Worst of 2001: The Top Ten Video Games of the Year". GameSpot. Archived from the original on December 27, 2001. Retrieved December 23, 2007. ^ "Spring 2004: Best. Game. Ever". GameFAQs. Retrieved March 8, 2008. ^ "Fall 2005: 10-Year Anniversary Contest—The 10 Best Games Ever". GameFAQs. Archived from the original on July 16, 2015. Retrieved March 8, 2008. ^ Semrad, Steve. "1UP 200 Greatest games of all time". 1UP.com. Archived from the original on September 27, 2007. Retrieved December 23, 2007. ^ "Top 200". Nintendo Power (200). February 2006. ^ "The Top 25 GameCube Games of All Time". IGN. March 16, 2007. Retrieved March 18, 2007. ^ "Top 25 GameCube Games of All-Time - #4: Super Smash Bros. Melee". GameSpy. August 12, 2005. Retrieved September 13, 2007. ^ "100 Greatest Nintendo Games Ever". Official Nintendo Magazine (40): 07. March 2009. ^ "EVO 2008 Championship series—SSBM". EVO 2008. March 5, 2008. Archived from the original on March 25, 2014. Retrieved March 18, 2008. ^ "Fighting Game Fans Raise over $225,000 for Breast Cancer Research. Smash Wins!". February 1, 2013. ^ Brown, Chris (March 10, 2011). "Know Your Roots: Ken Gets Carried". Major League Gaming. Retrieved February 18, 2012. ^ Dodero, Camille (November 21, 2006). "The Next action sport". The Phoenix. Archived from the original on July 9, 2016. Retrieved March 3, 2008. ^ Campbell, Sean (May 29, 2006). "Are they worth fighting for?". Got Frag. Archived from the original on February 10, 2012. Retrieved March 3, 2008. ^ "Armada - Adam Lindgren - Smash Player Profile". e-Sports Earnings. Retrieved September 2, 2018. ^ "Super Smash Bros. Melee Prize Pools & Top Players". e-Sports Earnings. Retrieved September 2, 2018. ^ Hernandez, Patricia (October 6, 2013). "A Fascinating Look At The World's Best Super Smash Bros. Players". Kotaku. Retrieved February 8, 2014. ^ O'Neill, Patrick Howell (October 6, 2013). "'The Smash Brothers' might be the best eSports documentary of all time". The Daily Dot. Archived from the original on February 21, 2014. Retrieved February 8, 2014. ^ Hernandez, Patricia (December 8, 2014). "Smash Bros.' Most Famous Moment, Explained". Kotaku. Gawker Media. Retrieved May 5, 2016. ^ Casamassina, Matt (May 17, 2005). "E3 2005: Smash Bros. For Revolution". IGN. Archived from the original on June 15, 2006. Retrieved December 1, 2006. ^ "Smash Bros. Revolution Director Revealed". IGN. November 16, 2005. Retrieved December 1, 2007. ^ Bramwell, Tom (May 11, 2005). "Miyamoto and Sakurai on Nintendo Wii". Eurogamer. Retrieved December 1, 2007. ^ "Four Kinds of Control". Nintendo. June 8, 2007. Archived from the original on March 2, 2008. Retrieved March 1, 2008. ^ Sakurai, Masahiro (May 23, 2007). "Link". Nintendo. Archived from the original on November 30, 2007. Retrieved December 1, 2007. ^ Sakurai, Masahiro (June 2, 2001). "Super Smash Bros. DOJO! !—Assist Trophies". Nintendo. Archived from the original on March 16, 2008. Retrieved March 18, 2008. ^ Sakurai, Masahiro (November 30, 2007). "Melee Stages". Nintendo. Archived from the original on August 22, 2009. Retrieved August 12, 2010. ^ Schreier, Jason (June 21, 2013). "An In-Depth Chat With The Genius Behind Super Smash Bros". Kotaku. Gawker Media. Retrieved April 25, 2015. ^ Karmali, Luke (October 7, 2014). "Super Smash Bros. on Wii U Gets Release Date". IGN. Retrieved October 7, 2014. ^ "『大乱闘スマッシュブラザーズ』"Miiファイター"参戦決定、『for Nintendo 3DS』発売日も決定！【E3 2014】" (in Japanese). Famitsu. June 11, 2014. Retrieved June 11, 2014. ^ Dyer, Mitch (June 10, 2014). "E3 2014: Super Smash Bros. for 3DS Delayed". IGN. Retrieved June 10, 2014.